The construction of a plank is, aside from the surface finishing, the most important quality factor in the choice of the correct parquet. The mafi typical 3-layer symmetrical construction consists of the top and back layers from the same wood in the same thermo treatment. The result is an equally strong counter-move, which greatly reduces the movement of the wood (swelling and shrinkage behaviour). The middle layer consists of an Austrian Pine cross-glued at 90°, which ensures extra stability. The softwood provides for a certain degree of flexibility, which reduces tension in the plank. The sum of these characteristics allows even more intense use of the wooden floor, such as on underfloor heating with the associated risk of gaps or also the use in bathrooms. Even when installing, there are more possibilities starting with different installation methods up to the topic of reduction of expansion gaps. Please note the mafi installation instructions. 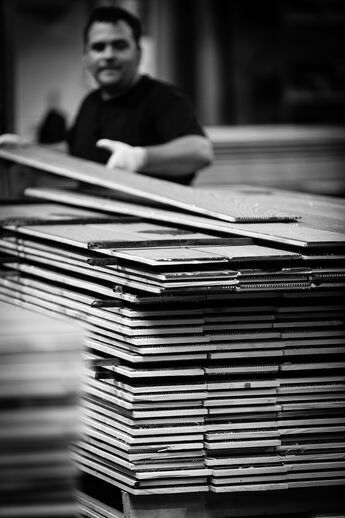 The construction of the mafi thin plank is manufactured in a multi-layer structure. The top and also the back layers are made from the same wood with the same thermal treatment. The top layer measures approximately 3 mm while the back layer is approx. 1.8 mm thick. For the middle layer, softwood elements positioned at 90° are used. 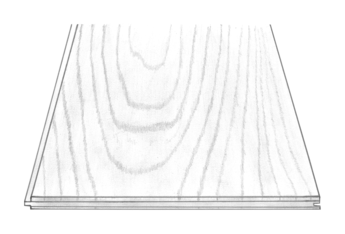 The thin plank has a total thickness of 10 mm and is ideal for installations with low structure heights, as often found in renovations. We recommend a full surface glueing of the planks on a standard-flat underfloor. The planks of the Piccolino Collection are manufactured in a compact multi-layer structure with a Spruce middle layer and Spruce as a counter-move. 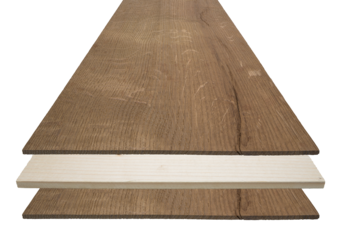 The thickness of the plank thus reaches 10mm in total, different to the planks with symmetrical 3-layer construction which can be 16, 19 or 21mm, depending on the product. The low height makes the floors of the Piccolino Collection especially attractive in restorations and renovations. Special installation patterns such as herringbone are also possible on request. 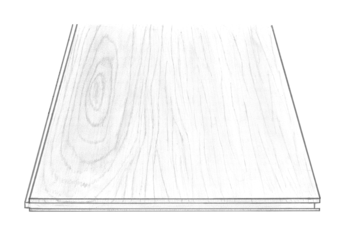 We recommend a full surface gluing of the planks on a standard-flat underfloor. The floors of the Domino Collection consist of grain-block wood cubes in the size of 40x40mm. These are delivered bonded in turn on a parquet-net in a 400 x 200mm format. This type of flooring has a long tradition as workshop floors in Austria and is characterised by its extremely high robustness. As these are solid wood floors, they must be full-surface glued on standard-flat underfloors. An expansion gap should be included every 25m². Please note the mafi installation instructions. What types of parquet construction are there? The construction is a decisive factor in the longevity and stability of the planks. 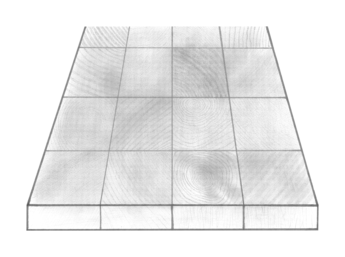 Generally, we distinguish between solid parquet and multi-layer parquet. Solid wood parquet uses the same piece of wood across the entire thickness. The swelling and shrinkage behaviour or the warping of the floor represents the largest problem with this type of construction. Underfloor heating increases this problem. Multi-layer parquet consists of different layers starting from the top layer. After that, mostly softer, less expensive woods are used as carriers. High-quality parquet floors have a counter-move and thus consist of three layers. How does the mafi constuction differ from other products? You can see a high-quality parquet floor construction with a symmetrical 3-layer construction. The symmetry is that both the visible top layer, and the back layer, also called the counter-move, must consist of the same wood and same treatment. This greatly reduces the natural movement of the wood across the width. The middle layer, in corresponding thickness’ and large softwood boards, should be glued at a 90° angle to the slats. Symmetrical 3-layer planks have far fewer gaps and are ideal for rooms with underfloor heating. "You should always check the construction of of the planks, because only a symmetrical design guarantees optimum stability - especially on underfloor heating."